The School of Arts and Humanities fosters the values of The College of Saint Rose by integrating theoretical exploration with practical application, critical inquiry with creative discovery, and intellectual curiosity with imaginative possibility. Examining the rich legacy of human expression across time and cultures prepares our students to participate as active citizens in a global age and equips them to leverage and employ humanistic traditions as a cornerstone for developing innovative approaches to emerging realities. The School cultivates independent and ethical thinkers with the knowledge and skills necessary to navigate dynamic and complex futures. Arts and Humanities students are uniquely positioned to address society’s challenges that traverse disciplinary boundaries and require deep introspection and sustained social engagements. The College of Saint Rose is a dynamic institution of higher education, enrolling nearly 4,000 students. Located in the City of Albany, the heart of New York State’s Capital Region, the College is a private, independent, coeducational institution, defined by dedicated faculty, administrators, and staff, all focused on transforming the lives of our students. Through a strong liberal education curriculum, and professional programs, Saint Rose serves four-year, transfer and graduate students in undergraduate, graduate degree and advanced certificate programs in four academic schools: Arts and Humanities; Business; Education; and Mathematics and Sciences. The College is preparing to celebrate its Centennial in 2020 with the launch of the 2016-2020 Strategic Plan which focuses on global connectedness, student success and fostering creativity and innovation. True to its role within the greater liberal arts community at the College and the School of Arts and Humanities, the Center for Art and Design shares major guiding principles and a mission statement reflective of common themes. The faculty believe that visual, creative, cultural, and design literacy are fundamental to a liberal arts education and necessary for navigating competitive professional environments. The Center for Art and design promotes these essential literacies through disciplined studio and research practices, intellectual challenge, and interdisciplinary exchange. The faculty are committed to each student’s ability to see aesthetically, act creatively, think critically, and make lasting contributions as innovative artists, designers, educators, scholars, and leaders. In anticipation of immediate needs and degree program growth within The Center for Art and Design, faculty invite qualified, experienced applicants for a full-time, tenure-track appointment as an Assistant Professor of Art – 3D Design/Sculpture, beginning Fall 2018. The ideal candidate will: be enthusiastic about teaching students at all levels; assume a leadership role in guiding current curricula for the BFA Graphic Design, BS and BFA Studio Art degree programs and a Foundations-level Three-Dimensional Concepts course that all emphasize a combination of traditional and digital practices; and, support the development of new degree programs that expand 3D visual art and design and the interpretation of the sculpture medium in contemporary practice. Identified areas for potential growth in the discipline include, but are not limited to: digital and expanded media, installation, 4-D/time-based practices, performances, and 3D digital fabrication. The candidate will demonstrate their ability to foster the development of each student’s: visual language; understanding of material processes and skill sets designed to take advantage of our 3D scanner/printer, laser cutter/etcher, fabrication, mold making, and casting facilities; and, conceptual approaches that expand their critical thinking and creativity. The candidate will also work with the Foundations Coordinator and faculty to grow the first-year and transfer curricula in a learning environment that prioritizes openness, innovation and collaboration. A primary focus of this position includes educating students on the safe operation and utilization of machines and tools. It is expected that the candidate will: prioritize health and safety; demonstrate the ability to develop protocols that enhance student learning; communicate effectively with all faculty and students who utilize the studios’ assets; assume primary responsibility for all related studio areas; and, supervise the Studio Technician. Other responsibilities include the oversight of materials and supply budgets, course fees, MSDS information, digital archives, and inventory. As a member of the faculty, the applicant is expected to: teach assigned courses in accordance with relevant academic policies; participate in academic advisement, liberal education and program assessment, recruitment events, student portfolio reviews and mentorship programs; maintain regular office hours; assist with student exhibitions and capstone experiences; engage in scholarship/creative research, exhibitions and professional practice; and, serve the Department, School and College communities through participation in committee work and events. The Center for Art and Design at The College of Saint Rose is an accredited institutional member of the National Association of Schools of Art and design (NASAD). Professional scholarship and creative work must demonstrate a commitment to research and continued artistic production and embody a developed level of technical ability and an understanding of contemporary concepts and issues in the field. Applications will be accepted until the position is filled. Screening will begin immediately. 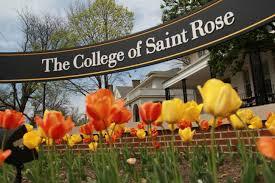 and open a College of Saint Rose Employment Account today!